I’m pretty happy with my Nexus S so far. It’s a decent phone with some solid apps and services. More importantly, it’s a well-equipped little pocket computer. However the more I use smartphones (and similar devices like the iPod Touch) the more I feel a nagging sense that I’m not really these devices well, at least not to their full potential. While the devices in our pockets might be increasingly powerful general purpose computers I feel like we use them more for communication than for computation. That’s not to say that communication does not require computation (it does, lots of it), but we’re not using our devices with the goal of solving problems via computation. This is perhaps a very programmer-centric viewpoint of mobile technology, but one that is important to consider. Even someone like me, who writes code on a regular basis to solve a variety of both personal and research problems, does very little computation on mobile devices. In fact, the most I’ve been using my Nexus for is email, RSS reading, Twitter, Facebook and Foursquare. While all those services definitely have good uses, they are all cases where most of the computation happens far away on massive third-party datacenters. The devices themselves act as terminals (or portals if you prefer a more modern-sounding term) onto the worlds these services offer. Just to be clear, I’m not saying that I want to write programs on these devices. Though that would certainly be neat, I can’t see myself giving up a more traditional computing environment for the purposes of programming anytime soon. However, I do want my device to do more than help me keep in touch with my friends (again, that’s a worthy goal but just the beginning). So the question is, what kind of computation do we want our mobile devices to do? Truth be told, I’m not entirely sure. One way to go is to have our phones become capable personal assistants. For example, I would like to be able to launch an app when I walk into a meeting (or better yet, have it launch itself based on my calendar and geolocation). The app would listen in on the conversation, apply natural language processing and generate a list of todos, reminders and calendar items automatically based on what was said in the meeting. Of course there are various issues (privacy, technology, politics, corporations playing nicely with each other) but I think it’s a logical step forward. As payment systems in phones become more popular, I’d like my phone to become my banker too (and I’m not just talking about budgeting and paying bills on time). For example if I walk into a coffee shop my phone should check if I’m on budget as far as coffee shops go and check coffee shops around the area to suggest a cheaper (or better, for some definition of better) alternative. And it doesn’t just have to be limited to coffee shops. Mobile technology is sufficiently new that most of us don’t have a very clear idea of what to do with it (or a vision of what it should do). Most so-called “future vision” videos focus more on interfaces than actual capabilities. However this technology is evolving fast enough that I think we’re going to see the situation improving quickly. With geolocation-based services, NFC and voice commands becoming more ubiquitous and useful the stage is becoming set for us to make more impactful uses of the processors in our pockets. As a programmer I would love to be able to hook up my phone to any cloud services or private servers I’m using and be able to interact with them. The mobile future promises to be interesting and I’m definitely looking forward to it. Posted on January 4, 2012 January 4, 2012 Categories Hardware, Internet, Productivity, Software, TechnologyTags android, cloud computing2 Comments on Where is the computation? This year I’ve decided to make a foray into the future by finally getting myself a proper smartphone. I’ve had an iPod Touch for a while but also had a simple Nokia not-smart phone to make actual phone calls. It’s always been somewhat annoying to have to manage two devices: a real phone for calls or texts and the iPod for any Internet and data-related work. A large part of my resistance to getting an actual smartphone was that I simply didn’t want to spend a lot of money on a cell phone plan when I was surrounded by wi-fi all the time and barely made actual phone calls. But now that there are finally both reasonably cheap unlocked smartphones and contract-free data plans I decided to bite the bullet. The unlocked iPhone 4S would end up costing me a tad over $800 after tax and Applecare. I was also getting bored of the iOS ecosystem and its closed, silo system for apps. So instead I got myself a much cheaper unlocked Android phone – the Google/Samsung Nexus S. I’m pairing that with a $30 a month T-Mobile data and phone plan. I’m still waiting for a new SIM card to show up but till then I’m making use of the ample wifi coverage that’s a side-effect of living in a college town. For now, I’m only going to talk about my first impressions on the Nexus S itself. 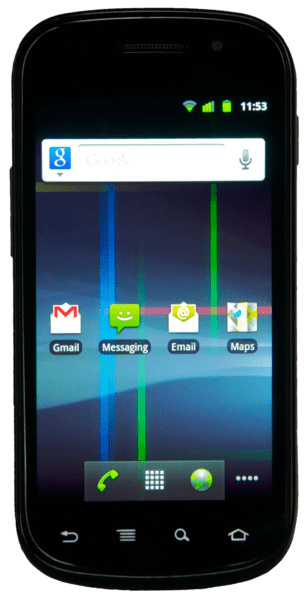 The Nexus S is Google’s previous flagship phone. Its current flagship is the Galaxy Nexus which Google is also selling unlocked. However it’s almost twice the price I paid for the Nexus S and in my opinion, isn’t sufficient of an upgrade to justify the price. Even though it’s about a year old by now (and technically running the old version of Android), I haven’t had a problem with it so far. It looks pretty different from the iPhone and the plastic feel takes some getting used it. I also think it slips more easily, but that might just be a personal problem. The back of the phone has something of a ridge at the bottom which I guess is supposed to make it easier to hold. Though the build quality does feel inferior as compared to the iPhone, I like it and have no major complaints. The Android sofware feels like a breath of fresh air as compared to the iPhone. It is considerably more customizable and I like the presence of both tradiiontal apps as well as “widgets” that add functionality directly to your home screens. I’ve found widgets great for quickly looking up data like the weather, Twitter mentions or what system services are currently running. The tinkerer in me loves how customizable the Android system is. Changing the look and feel is just the beginning. There are a lot of bells and whistles and options and sometimes it can be a rather confusing. For now I’ve only stuck to the usual set of apps (Twitter, Foursquare, Camera) but I’m looking forward to trying out new and interesting apps in the future. More than that I feel like Android would be a really good platform if I decide to get into mobile dev anytime soon. There are a few things about the Nexus S that I’m concerned with. I think the battery life is a tad too short, especially with the geolocation services on all the time. Luckily, the battery monitor widget makes it simple to turn off services with a touch so maybe some manual management might make it better. While the Google apps are really well integrated (especially Google Voice) and apps from large companies are well done, third-party apps seem to be of considerably less quality than iOS equivalents. I don’t really blame the developers given the multitude of devices but it does mean that finding good apps for simple things like RSS is more difficult than it should be. Despite the glitches and minor annoyances I really like the Nexus S. The hardware is pretty solid and I like Android so far. Right now having a fully functional smartphone is still pretty new to me, but I’m hoping that when the novelty wears off I’ll dive into actually programming the powerful computer in my pocket. More shell, less egg It’s alway a joy to see two masters at the top of their craft engaged in a respectful, but determined duel. This is a short commentary on Donald Knuth and Doug McIlroy’s approaches to literate programming. Worth reading even if you’re not a big fan of literate programming. Selective use of technology I firmly believe that science and technology is a good thing and that our world is better because of them. However I also understand that technology cannot do everything for us. In particular there are a lot of decisions it cannot make for us (yet). I also tend to get a lot of my best work when I am least partially disconnected and can hold at bay the full force of the Internet. All things in moderation. Why sugar makes us sleepy (and protein wakes us up) As much as many of us would like to live as if we disembodied brains surviving on anything that barely resembled food, that is definitely not the case. Since we are stuck with our flesh-and-blood physical bodies for the foreseeable future, it is a good idea to figure out how it all works and make the most of it. Do the Work While I’m not entrely a fan of Steven Pressfield’s use of vaguely “spiritual” ideas and terms, this book is still worth reading for everyone. It’s especially useful if you have that big project you’ve been thinking about but never got around to actually starting. At $1.99 for the Kindle edition, it’s a steal. What we actually know about software development Despite the importance of software development, most developers are acutely unaware of the scientific studies in the area and rely mostly on anecdote. Luckily there is an increasing amount of research in software development (not to be confused with computer science) and it’s worth knowing what we actually know about the field and what is myth. The article helped me express an uncertainty that’s been floating back and forth in my mind for some time. I use my iPod Touch on a daily basis and I’ve been loving the multitouch trackpad on the new Macbooks. I love the swiping motions for window management and moving things around. At the same time I’ve started drawing by hand again (I loved drawing as a kid) and I realize that putting a pencil to paper is a rather complex but very fulfilling activity. Strangely enough I think that both the pencil and the touch-based iOS interface have a lot in common. In both cases, the actual physical device almost disappears letting you focus on the underlying application. The iPad or iPhone itself is just a thin frame around whatever app you’re using. The pencil is basically just a simple pointer but allows us to create an infinited range of images with it. However in both cases, the expressiveness offered by the device is not enough. Pencils are not enough to express all the images we might want to create. That’s why we have pens, brushes, chalk, crayons and a variety of papers and canvases. The flat touch interface is also not enough, especially if we are confined to a small surface that fits in one hand. The question then is how we can take the simplicity of our current touch interface and extend them to a larger set of expressions and interactions? Case in point is the camera interface on the iPhone. For a long time there was a software button that you had to touch to take a picture. But that meant sticking your finger in the middle of the picture. Normal cameras have a better interface: there is shutter button on the top that keeps your hands far from the actual image (even if you’re using a LCD screen instead of a traditional viewfinder). This deficient interface on the iPhone led to the Red Pop, a giant red shutter button and now iOS 5 turns one of the hardware volume buttons into a shutter button. Having a fluid, upgradeable, customizable software interface is nice and I like smooth gradients and rounded corners as much as the next guy. But our hands evolved to use actual physical matter and before computer interfaces we built a lot of interesting physical interfaces. Apple has hooked us on the idea of sleek, smooth devices with no extraneous. While it’s great to lose unnecessary knobs and edges the Apple design philosophy might not be best in the long run, especially if your device’s UI doesn’t neatly fit into the touch-drag-swipe system of gestures. Ultimately it would be great to have “smart matter” physical interfaces – the flexibility and programmability of software with the physical usability that solid matter offers. Imagine some sort of rearranging material (based on some form of nano- or micro-technology maybe?) that can be be a simple smooth shell around your interfaces but can change to form buttons, sliders, knobs or big red shutter buttons as your application requires. But in the years (decades?) between now and then we need other solutions. The range of accessories and extensions available for the iPhone (including the Red Pop, tripods, lenses etc.) seem to suggest that enterprising young device maker could use the iPhone (and it’s successors and competitors) as a computing core to which they can attach their own physical extensions. With a more open and hackable platform (an Android-Arduino hybrid perhaps) we might see a thriving device market as well as an app market. Am I a dreamer? Hell yeah, but as the projects I’ve linked to show, I’m certainly not the only one.